Photo resistors, also known as light dependent resistors (LDR), are light sensitive devices most often used to indicate the presence or absence of light, or to measure the light intensity. In the dark, their resistance is very high, sometimes up to 1MΩ, but when the LDR sensor is exposed to light, the resistance drops dramatically, even down to a few ohms, depending on the light intensity. LDRs have a sensitivity that varies with the wavelength of the light applied and are nonlinear devices. They are used in many applications but are sometimes made obsolete by other devices such as photodiodes and phototransistors. Some countries have banned LDRs made of lead or cadmium over environmental safety concerns. Photo resistors are light sensitive resistors whose resistance decreases as the intensity of light they are exposed to increases. Based on the materials used, photo resistors can be divided into two types; intrinsic and extrinsic. 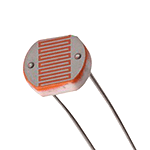 Intrinsic photo resistors use undoped materials such as silicon or germanium. Photons that fall on the device excite electrons from the valence band to the conduction band, and the result of this process are more free electrons in the material, which can carry current, and therefore less resistance. Extrinsic photo resistors are made of materials doped with impurities, also called dopants. The dopants create a new energy band above the existing valence band, populated by electrons. These electrons need less energy to make the transition to the conduction band thanks to the smaller energy gap. The result is a device sensitive to different wavelengths of light. Regardless, both types will exhibit a decrease in resistance when illuminated. The higher the light intensity, the larger the resistance drop is. Therefore, the resistance of LDRs is an inverse, nonlinear function of light intensity. The sensitivity of a photo resistor varies with the light wavelength. If the wavelength is outside a certain range, it will not affect the resistance of the device at all. It can be said that the LDR is not sensitive in that light wavelength range. 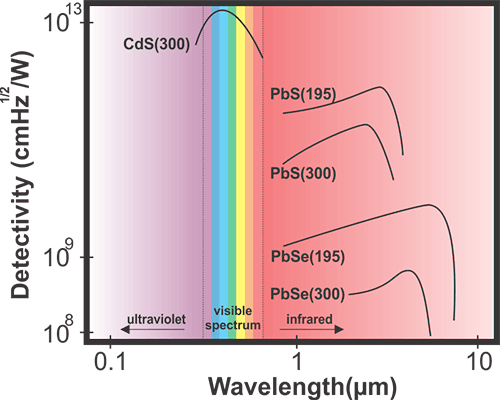 Different materials have different unique spectral response curves of wavelength versus sensitivity. Extrinsic light dependent resistors are generally designed for longer wavelengths of light, with a tendency towards the infrared (IR). When working in the IR range, care must be taken to avoid heat buildup, which could affect measurements by changing the resistance of the device due to thermal effects. The figure shown here represents the spectral response of photoconductive detectors made of different materials, with the operating temperature expressed in K and written in the parentheses. Light dependent resistors have a lower sensitivity than photo diodes and photo transistors. Photo diodes and photo transistors are true semiconductor devices which use light to control the flow of electrons and holes across PN-junctions, while light dependent resistors are passive components, lacking a PN-junction. If the light intensity is kept constant, the resistance may still vary significantly due to temperature changes, so they are sensitive to temperature changes as well. This property makes LDRs unsuitable for precise light intensity measurements. Another interesting property of photo resistors is that there is time latency between changes in illumination and changes in resistance. This phenomenon is called the resistance recovery rate. It takes usually about 10 ms for the resistance to drop completely when light is applied after total darkness, while it can take up to 1 second for the resistance to rise back to the starting value after the complete removal of light. For this reason the LDR cannot be used where rapid fluctuations of light are to be recorded or used to actuate control equipment, but this same property is exploited in some other devices, such as audio compressors, where the function of the light dependent resistor is to smooth the response. Since the discovery of selenium photoconductivity, many materials have been found with similar characteristics. In the 1930s and 1940s PbS, PbSe and PbTe were studied following the development of photoconductors made of silicon and germanium. Modern light dependent resistors are made of lead sulfide, lead selenide, indium antimonide, and most commonly cadmium sulfide and cadmium selenide. 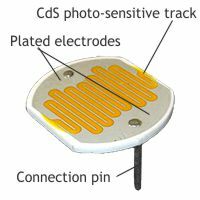 The popular cadmium sulfide types are often indicated as CdS photoresistors. To manufacture a cadmium sulfide LDR, highly purified cadmium sulfide powder and inert binding materials are mixed. This mixture is then pressed and sintered. Electrodes are vacuum evaporated onto the surface of one side to form interleaving combs and connection leads are connected. The disc is then mounted in a glass envelope or encapsulated in transparent plastic to prevent surface contamination. The spectral response curve of cadmium sulfide matches that of the human eye. The peak sensitivity wavelength is about 560-600 nm which is in the visible part of the spectrum. It should be noted that devices containing lead or cadmium are not RoHS compliant and are banned for use in countries that adhere to RoHS laws. Photo resistors are most often used as light sensors. They are often utilized when it is required to detect the presence and absence of light or measure the light intensity. Examples are night lights and photography light meters. An interesting hobbyist application for light dependent resistors is the line following robot, which uses a light source and two or more LDRs to determine the needed change of course. Sometimes, they are used outside sensing applications, for example in audio compressors, because their reaction to light is not instantaneous, and so the function of LDR is to introduce a delayed response. 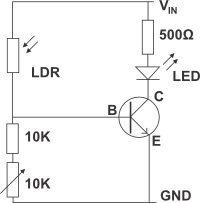 If a basic light sensor is needed, an LDR circuit such as the one in the figure can be used. The LED lights up when the intensity of the light reaching the LDR resistor is sufficient. The 10K variable resistor is used to set the threshold at which the LED will turn on. If the LDR light is below the threshold intensity, the LED will remain in the off state. In real-world applications, the LED would be replaced with a relay or the output could be wired to a microcontroller or some other device. If a darkness sensor was needed, where the LED would light in the absence of light, the LDR and the two 10K resistors should be swapped. Audio compressors are devices which reduce the gain of the audio amplifier when the amplitude of the signal is above a set value. This is done to amplify soft sounds while preventing the loud sounds from clipping. Some compressors use an LDR and a small lamp (LED or electroluminescent panel) connected to the signal source to create changes in signal gain. This technique is believed by some to add smoother characteristics to the signal because the response times of the light and the resistor soften the attack and release. The delay in the response time in these applications is on the order of 0.1s. The following symbol is used to depict light dependent or photo resistors according to the IEC standard. 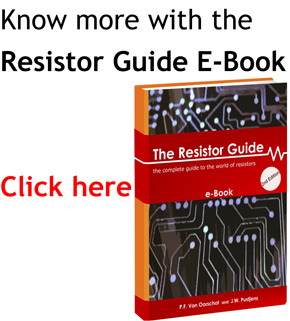 Sometime the resistor symbol is circled, with the arrows outside the circle.